Goodbye very friendly and super happy Koreans, Buongiorno very tanned Italians. On arrival mummy opened up the secret bugaboo toy chest. We have finally arrived in Milan after another 11 hour flight, I am so glad to be off that plane. Don’t get me wrong, mummy and daddy did a very good job of keeping me entertained, but I was very much over it, on the second leg. 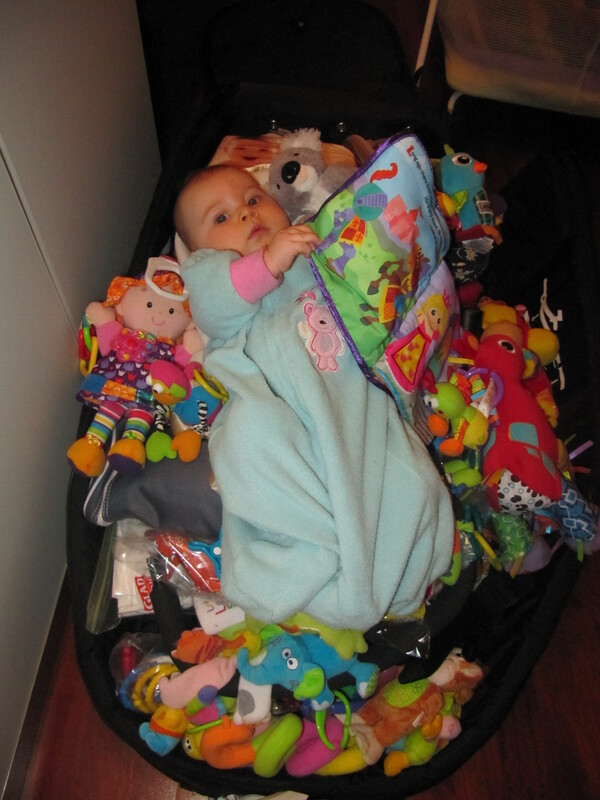 When we arrived mummy unveiled the secret toys she had hidden in the bugaboo bag. It is really warm here, so I get to wear the new dresses mummy bought me recently and some cool ones I have been waiting to grow into, Yay! Our first day in Milan was jam packed! Our day started in the very early hours of the morning, I think I am suffering from a little bit of jet lag as I woke up at 1:30am and wouldn’t get back to sleep until 4am. We had a nice breakfast in the hotel and then mummy had the whole day planned. 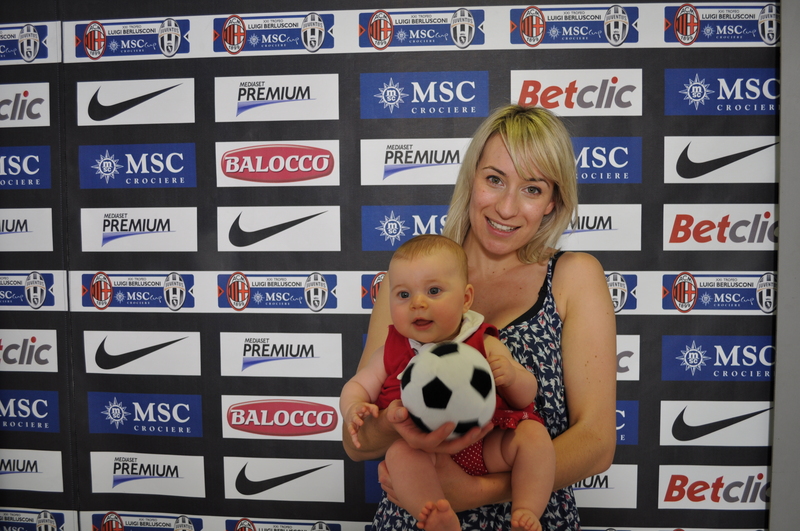 First stop was San Siro or for those who are not football fans, the home Stadium for AC Milan and Inter Milan. It took us a little while to find it. 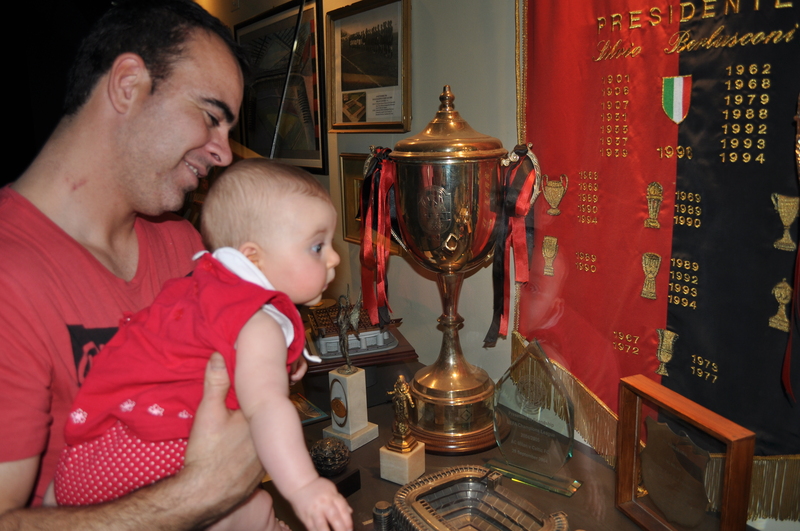 We walked through the museum admiring all the big trophies then had a tour through the stadium. 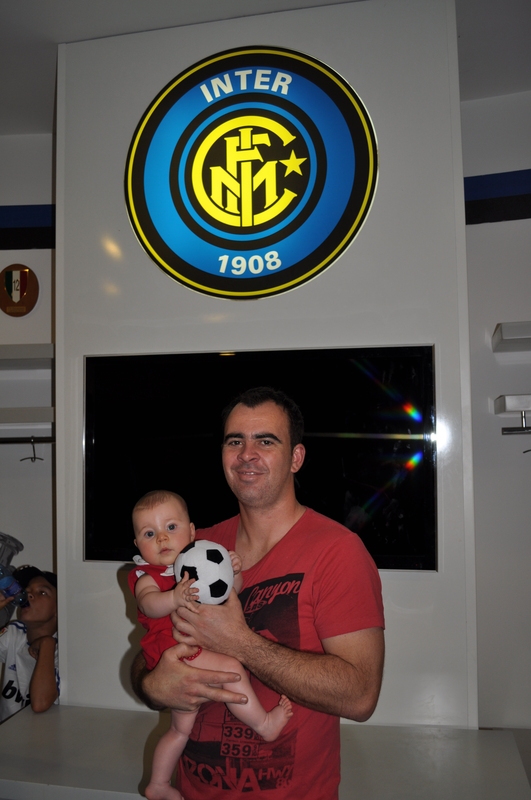 There is a match tomorrow so we couldn’t visit the AC Milan change room, but we had sneaky peak at the Inter Milan one. Look at all those big shiny things! 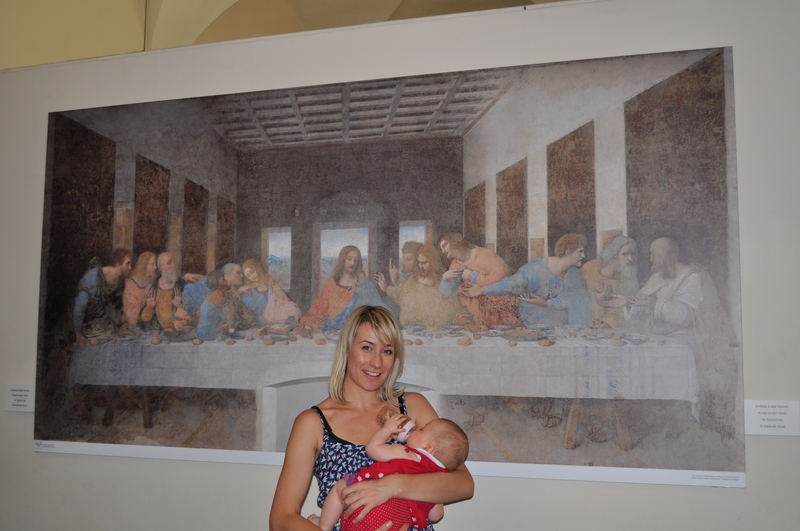 Next stop was Leonardo Da Vinci’s ‘Last Supper’. Mummy had read all about and had seen prints of it many times but I think she was very surprised how big it was. It was HUGE and really beautiful. Fun fact of the day: It took Leonardo Da Vinci 3 years to complete the ‘Last Supper’ in 1495, however it took 22 years to restore it, and only 80% of the original colour has been restored. After lunch we took the tram to the Duomo (Milan’s Cathedral), which is the worlds largest of its kind. It was massive! I felt like a little ant looking up at this stunning building. We couldn’t go in to have a look because mummy was wearing a dress and there is a dress code to enter the building – thin straps and above the knee was not acceptable. So we took a walk through Galleria Vittorio Emanuele II and had some Gelato – unfortunately I was asleep through this part so daddy didn’t have any chances to sneak me a taste. To be honest I was asleep for the rest of the day but mummy told me that they continued their adventure through Milan,with some window shopping and visiting a Food Emporium just down the road from the Duomo. After a quick dinner we went back to the hotel to finish the day. I was exhausted, but it was a really fun day. 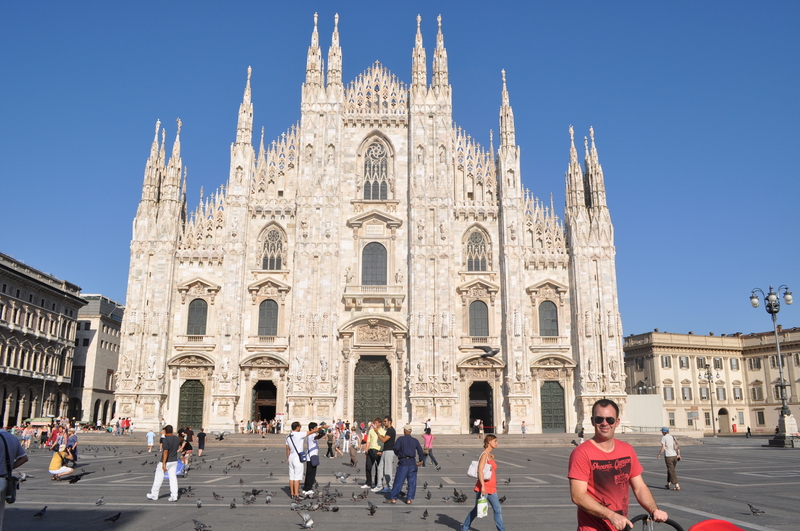 There was so much to see and learn about Milan. Tomorrow we are picking up the hire car and either driving to Lake Como or Verona.